Here are the top 10 key reasons our customers believe Hines Benders are absolutely the best choice. Global Customers. In nearly every continent, there are Hines Benders. Hundreds of them. Very rarely do you ever find a “used” Hines Bender. Customers love the fact that once they are installed, they are unstoppable. And our Induction Benders are so innovative they are taking the oil, gas, petrochemical and mining industries by storm. Repeat Customers. Many of our customers own more than one bending machine. We’re proud of the fact that many Fortune 500 companies use our machines. We’re also proud of the many start-ups who have gotten a “leg-up” by using our machines. The OEM Advantage. Many of our competitors resell other brands of machines so they have little influence on new innovations, whereas Hines Bending does. Our dedicated team of engineers has been doing this for a long time. They do things right. Addressing a Changing Marketplace. Because we own the factory, we are able to bring new types and models of bending machines to market very quickly. Our ability to recognize and integrate customer needs, means you will always be purchasing a state-of-the-art bending machine. Unequalled Quality. For starters, check the weight on the bending machine for which you have an interest. Because Hines Benders are manufactured using the strongest, most durable steel, they are nearly twice the weight of a competitor’s model. But it’s not just about the machine’s weight. Ask any of our customers. Hines Benders require very little maintenance. Rarely does something “break,” and when it does, we plot an immediate solution to fix it. Strong Partner Network. We can’t provide world class customer service without the help of world class partners. You will need tooling and lubricants and service and sometimes financing. We have long-standing, trusted relationships with key partners. Built with Non-Proprietary Parts. Because we build Hines Machines with non-proprietary parts, when something does go wrong, rather than waiting for us to overnight a part, we’ll track down the closest supplier so you can buy it direct. This eliminates the middle man, not only saving money, but ensuring the fastest service possible. Cost. Our machines cost less than our competitors. Period. We keep our overhead low and pass those savings on to you. Additionally, we don’t “nickel and dime” you to death. We know what you need to be successful, and package accessories and features into the total price of the machine. Experience. It’s not just the years that we’ve been manufacturing machines, it’s the expertise we have accumulated along the way. We listen to your needs. We know your industry. And we know that sometimes doing things differently makes all the difference in the world. There is always a better mousetrap. Choice. At last count, we sell 34 different models of tube and pipe bending machines. Regardless of your need application or industry, chances are pretty good we can help you choose the best bending machine. 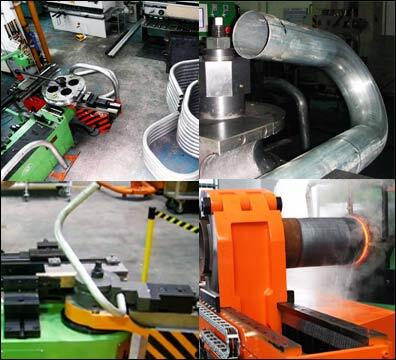 TUBE AND PIPE BENDER EXAMPLES THROUGHOUT THE WORLD.